ASP of Dallas’ Second Annual Community Action Day involved 97 volunteers and touched hundreds in the community! 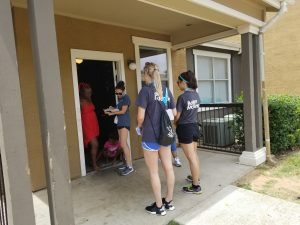 – All Stars Project, Inc.
ASP of Dallas’ Second Annual Community Action Day involved 97 volunteers and touched hundreds in the community! On June 30th, All Stars Project of Dallas and the Dallas Police Activities League (PAL) hosted the second annual Community Action Day, which is part of a national effort to engage communities in a new way by creating conversations for growth with people from all walks of life. 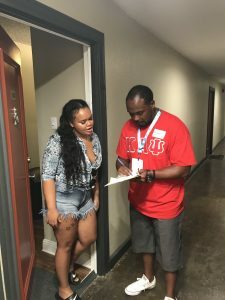 Ninety-seven people volunteered to go into South Dallas, South Oak Cliff, Vickery Meadow and West Dallas communities and spark new dialog with residents about what their communities and youth need, such as job training, afterschool programs and more. The day began at the First Presbyterian Church of Dallas where everyone received a Community Action Day lanyard. All Stars City Leader Antoine Joyce and program and outreach coordinator Dee Smith led an improv activity and training where everyone had an opportunity to practice their door-knocking script. In the community, volunteers engaged in conversation with a questionnaire which triggered hundreds of new discussions, and 133 people completed a survey. Having access to quality education was a priority for 50% of the people we spoke with. After the door-knocking performance, volunteers met back at the church for a debrief and lunch sponsored by Baker McKenzie. The Dallas Police Department’s Assistant Director and Chief of Staff, Thomas Taylor spoke during lunch and said: “Thank you for allowing the Dallas Police Department to partner with the All Stars and thank you for continuing to lead deeply in our communities. The Dallas Police Department will always be here with you”. Special thanks to ASP of Dallas board member and Baker McKenzie Principal, Michelle Hartmann for their sponsorship and to the seven staff who joined the event. For more information on volunteer opportunities, contact Dee Smith at 214-484-2112 or dsmith@allstars.org.